The following pictures are from a nearly two-week expedition that myself and five other photographers spent undertook exploring incredibly remote and unspoiled fjords, glaciers, icebergs, and granite peaks that rise thousands of feet - areas with no trails or established tourism. We backpacked nearly the entire time carrying all of our equipment & food, and making camp every night for golden hour shots - we even saw the northern lights three times! Most of the time, we didn't encounter any other people on our journey. Flanking the iceberg-filled waters of the Tasermiut Fjord are huge granite peaks with near vertical walls, some of tallest mountains in Greenland and the arctic. Few places in the world have blown me away quite like this very southern portion of Greenland. Overlooking the fjord are the towering walls of Ulamertorsuaq - a big wall climber’s dream, rising more than 6,000 feet (nearly 2,000 meters) - and Ketil, the tallest mountain in the region. On the first day of trekking near the Tasermiut Fjord, our group encountered beautiful low-lying fog circling the peaks seen in the first two photos of this set. The Qooroq Glacier in southern Greenland expels over 200,000 tons of ice into its waters every day, generating icebergs of all shapes and sizes. After calving off the glacier, icebergs float aimlessly in the huge fjord and the soft light of the typical overcast weather really accentuates their beautiful blue color. 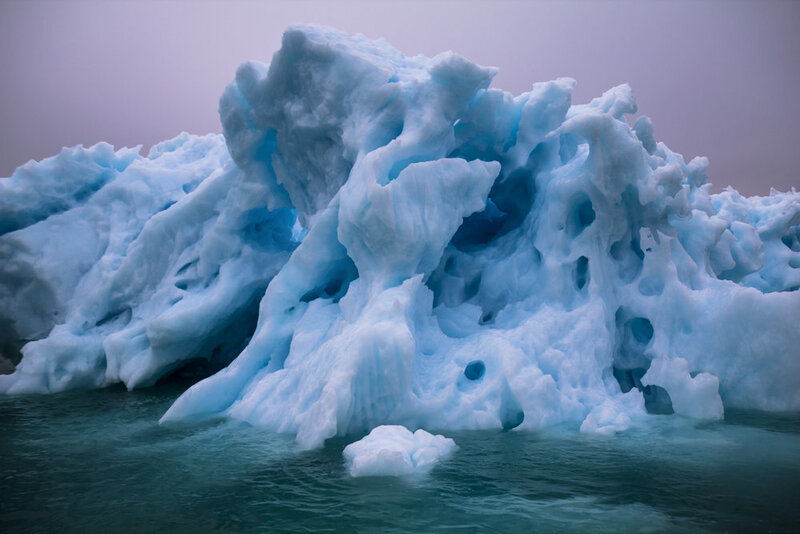 Older icebergs, battered by the waves of the fjord, begin their slow deterioration, revealing beautiful arches, outcroppings, and bizarre shapes. 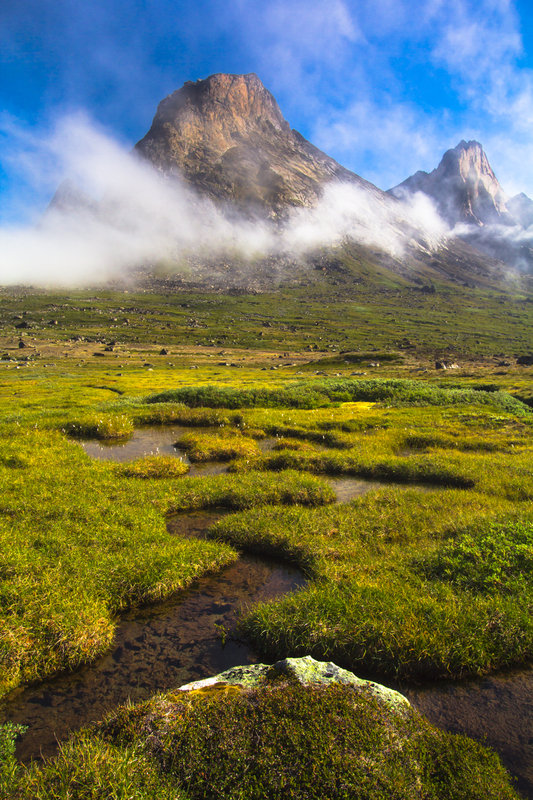 The Itillersuaq Valley is an incredible two-day hike with views of dozens of peaks on both its northern and southern ends. 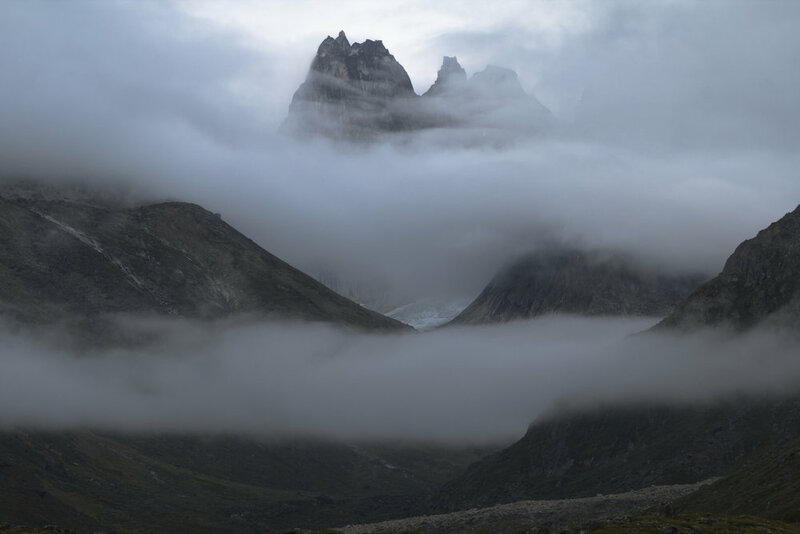 The first picture shows the fog that laid low the first morning at camp and accentuated the height of the peaks in the background. At the end of the hike, the group trekked off-trail up a steep mountain to a rock outcropping approximately 700 meters up. The view from the top of the Torssukatak Fjord (second and third pictures) is my favorite from Greenland one of the most epic views I have ever seen. Greenlandic fjords with glaciers at their end calve huge icebergs that float around the water until they eventually melt. The Kangerdluk Fjord is one of those fjords and we boated around its waters on a warmly lit and peaceful overcast morning photographing the icebergs. The fjord provides access to a three-hour hike into a nearby valley, which lit up during sunrise and sunset. At the valley end, a granite massif overlooks the river that flows from it providing fantastic foreground.